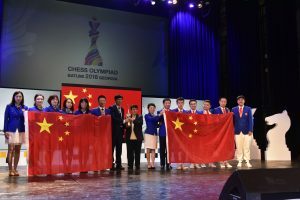 The Chinese won both the Open and Women’s sections in Batumi. A rare and outstanding achievement. Your editor is fresh back from a short holiday and, as you might expect, there is plenty to catch up on. This week we’ll get an update on Round 1 of the Calderdale Evening League 2 matches which took place last week and also the second round of League 1 matches that (mostly!) took place this week. Before all of that though it would be most remiss not to reflect on the chess event that has been dominating coverage on all the big chess news sites for the last two weeks. What do you mean ‘Which event?’ Surely you’ve noticed that the biggest (literally) chess event in the world has been taking place in Batumi, Georgia. Yes, I mean the chess Olympiad. Hillarp Persson vs. Laurusas. White to move. 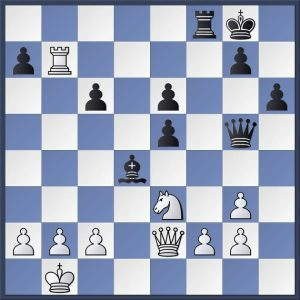 Black has just played Qf1 threatening to pick up the bishop after Qg2+ next. 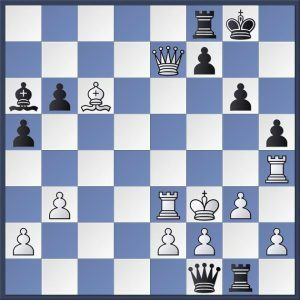 Can you see how the legendary attacker Tiger Hillarp Persson concluded the game with White here. For the past three editions of this great event, which is a real personal favorite of mine, I’ve been involved with running the Fantasy Chess Olympiad. Along with Matty Webb who did all the clever web development work, we’ve had a great time entertaining a global audience and providing them with an opportunity to engage with the Olympiad in a new and interesting way. Sadly, this time around, we both concluded some months ago that neither of us had the time or the energy to run it again. We hope it will make a return for the 2020 edition. In some ways, not having the FCO to worry about over the last two weeks has left me with more time to enjoy the event itself. It has been extremely well covered in all the usual places and, for a change, England have actually performed creditably well. The team this time consisted of Michael Adams, Luke McShane, David Howell, Gawain Jones and Nick Pert (Nigel Short was busy making a monkey of himself as a candidate for the FIDE presidency which is too long and tawdry a tail to discuss in any more detail here). After 9 of the 10 rounds England had managed to manouevre themselves into a three way share of third place and were genuine medal contenders having lost only one match to Azerbaijan at that stage. Haast vs. Kosteniuk. Black to play. Former Women’s World Champion Alexandra Kosteniuk finished off her opponent her in elegant style. The firs move is fairly obvious but can you see the whole idea? Unfortunately, they were then drawn against the Russians in round 10 and, despite the fact that the Russian line up looked marginally less frightening than it might have done (no Grischuk or Svidler), they still managed to beat our heroes fairly convincingly with Vladimir Kramnik on board 3 (!!!) downing David Howell in the only decisive game of the match. However, after this set back, England picked themselves up and managed to crush Kazakhstan to finish the event in fifth place. This is the best result for England at an Olympiad for over 20 years so congratulations to them. In the end the Chinese won both the Open and Women’s sections following a dramatic final round that saw the infamous Sonneborn-Berger tie break invoked. this effectively meant that the final result wasn’t known for quite some time after all the top teams had finished as the results of their earlier opponents was also needed in order to calculate the tie break scores. I might well return to the Olympiad briefly in my next post but for now, I’d like to share a couple of interesting positions that caught my attention. These are both featured on the right. See if you can find the winning continuations in both situations. The solutions are given (along with the games in full) in the game viewer at the bottom of this post. Elsewhere in League 2, Brighouse dispatched Belgrave ‘C’ at the Belgrave Club with Robert Broadbent, Nick Hudson and Adrian Dawson all scoring wins for the visitors. Steve Harrington managed an excellent consolation point against Paul Whitehouse on board 3 and the bottom board was drawn. The local Halifax derby was only contested on four boards with the ‘B’ team sweeping aside the ‘C’ team on all of those to win the match 4 – 0. These results see the new Huddersfield ‘C’ outfit go top of the table with Halifax ‘B’ and Brighouse in hot pursuit. One would expect these three teams to be duking it out right through the season. This week the second round of League 1 fixtures took place. But, before we dive into those it’s worth mentioning that the Huddersfield ‘A’ vs. Huddersfield ‘B’ match, which was postponed from round 1, also took place on the 24th of September and resulted in a surprising and resounding defeat for the senior side by 4 – 1. The lower rated players in the ‘B’ team on boards 3, 4 and 5 all managed wins whilst on the top two boards, where the match ups were more even, the games were drawn. This week though, Huddersfield ‘A’ bounced straight back on Wednesday night when they fielded a much stronger team against a Halifax ‘A’ side who were, conversely, far weaker than they had been against Hebden Bridge ‘A’ (@Golden Lion) in the first round. Even though Huddersfield defaulted their fifth board, they won on three of the others as Greg Eagleton, Mitchell Burke and Nick Sykes beat Richard Porter, Vivienne Webster and Pete Moss respectively. Nick has sent us his game which you will also find in the viewer at the end of this post. By turns, Huddersfield ‘B’, having bagged that excellent derby win were soundly thrashed by Belgrave ‘A’ who had only managed a draw in their own derby match in the first round of fixtures. John Morgan on board 1, Karim Khan on board 4 and Steve Harrington (Again! He’s 3/3 for the season so far against higher rated opponents) on board 5 all won. On boards 2 and 4 Huddersfield managed to hold draws against higher rated opponents. The two teams looked evenly matched on paper, and so it turned out on the night. Neil Bamford’s win for Hebden Bridge after a long endgame on board 4 was matched by Dave Colledge’s on board 5 for Belgrave. The other three games were drawn, leaving the final score level. The big clash between Hebden Bridge ‘A’ and Hebden Bridge ‘B’ will take place at the Golden Lion on Monday night as the venue was not available for the match to be played last Monday. Should Hebden ‘A’ win that match then there would be no teams in the league with a 100% record after just two matches! It looks like this season could become very interesting indeed. Off we go again! No half measures!